The proportion of the national income received as wages diminished from about 41% to 354 per cent., but the receipts per wage-earner increased about 34 per cent. The proportion received by persons assessed to income-tax increased slightly. 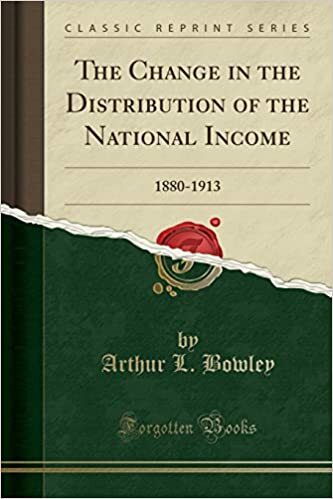 The number of such persons increased more rapidly than the occupied population (or the number of persons with separate incomes) and if to allow for this we measure incomes above £225 in 1913 and compare them with incomes above £160 in 1880, the proportions of the total are 47 per cent. At the earlier and 444 per cent. At the latter date. The proportion received by the intermediate class in creased at least, on my method of reckoning, from 14 per cent. Of the whole in 1880 to 17 per cent. In 1913. The evidence points to a greater increase, which, when we add in the incomes in 1913, between £160 and £225, is from 114 per cent. At the earlier date and 20 per cent. At the latter.